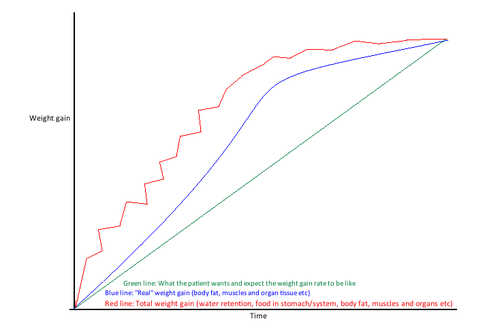 Letsrecover recovery forum » Physical » Random weight gain! Hello my lovely sisters ( and brothers ) ! FIRST NUMBERS: IN THAT POST!!!!!! I started my recovery in 2012 with waaay too less calories ( 1200 ) in increased it to 1350. Nothing happened and I even wasn't really ready for any recovery, but you have to know it was a huuuuge step to go to 1350 from my far away than 1000 calorie goal the year before. So nothing happened, but suddently in winter I randomly gained 2 kg and did no why! I totally freaked out and restricted again a bit to maintain. In summer i increased again because I maintained for a long time and nothing happened again...until winter. I did not exercise in both , winter and summer , so this wasn't the reason. I gained another 2kg until Summer and then it was over! So I had enough and decided to do less than minniemaud, but much more than before for 4 weeks ( around 2500 ), so I gained 5 kg while feeling energic and good. But then I decided to take a gain break because i couldn't handle more...so I went back to around 1700 and maintained...but suddently the weight gain started again with the cold weather. WHAT THE HELL IS THAT?! Please tell me what this was?! I think many here experienced such a thing!